1. How much food do you eat during Thanksgiving Day dinner? "Most of my relatives prefer their cranberries in cranberry sauce or cranberry bread, but Thanksgiving for me is a time for loading up on cranberry schnapps." Excepting Alice . . . Album Review: A epic classic from the hippie era, "Alice's Restaurant Massacree" has been a Thanksgiving Day classic at many radio stations over the years. But if your local stations have all been caught in the clutches of corporate-takeover playlist purgatory and you've never heard "Alice's Restaurant," here is your chance. 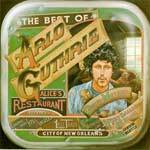 On this best-of collection, you get that opus with a bunch of other Arlo classics, including the fine songs "Cooper's Lament" and "Darkest Hour"; another fun spoken-word tale in "Motorcycle Song (Significance of the Pickle)"; and, of course, his two smash hits, "Coming into Los Angeles" and "City of New Orleans." A short, amusing video clip showing that American Thanksgiving traditions are alive and well and living in ... the airport. Watch funny thanksgiving travel video.